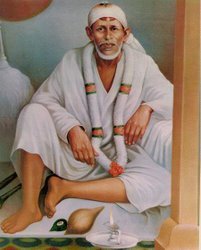 These amazing pictures of Shirdi Sai Baba, are of Huge Canvas hand paintings of Sai Baba of Shirdi. Size of the paintings are 5 ft X 8 ft and 4ft X 6ft. 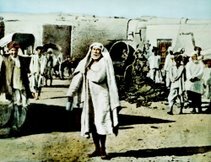 There was one painting of Sai Baba painted on when Baba was in physical body. Shri Sai hugged that painting and said, “This will live”. 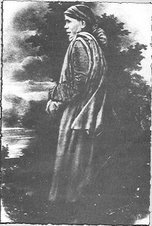 The painting was painted by Shri Shyamrao Jayakar. Devotees take darshan of that painting and bow in reverence in Dwarkamai since years. 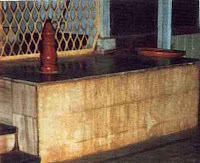 Mukh Darshan is the place of devotion, from where devotees can take Darshan of Sai Baba’s idol in Samadhi Mandir, Shirdi. 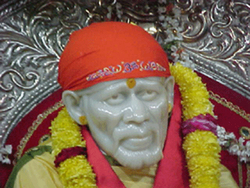 There is permanent stage of white marble built in this area, where devotees can sit and gaze at Sai Baba idol to their hearts content, can sit there and Chant Sai Baba’s Name, can read Sai SatCharitra and can also have darshan of Dwarkamai which is adjacent to the stage.This place, attracts many devotees. There was a change there in December 2005. A huge hand painted canvas painting of Sai Baba decorated the wall . The painting has some amazing qualities. The temple was adorned with one more divinely gifted art. Baba loves Naamsamran and bhajans. 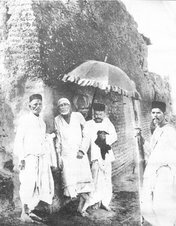 The canvas painting of Sai Baba here takes us to Shirdi Sai’s Durabar where singing and chanting of God’s name and glory use to happen and happen even now. We also see a beautiful painting of Sai Baba at Parayan Hall . The parayan hall is the place where devotees do Shri Sai SatCharitra Parayan, while they are in Shirdi. The walls of Parayan Hall is decorated with beautiful art - hand painting on canvas displaying Sai Baba and devotees. 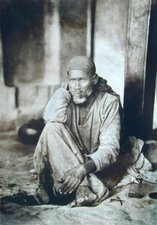 The paintings takes us to those days when Shri Sai performed leelas, while in physical body. The above two mentioned huge hand paintings are painted by Artist Shri Sunil Shegoankar. We can also see 2 paintings by Sunilji in SatyaNarayan Kasksh, where SatyaNarayan puja and katha happens daily. There is one more canvas painting in Prasadalaya . While watching Sai Baba’s paintings painted by Artist Sunil Shegaonkar, it becomes apparent that the paintings are blessed by Baba. Some of the pictures of paintings, they look more like real pictures and photos rather than paintings. All the painting are pieces of very good art work blessed by Shri Baba. Last month when i was in Shirdi, i happened to meet the artist who painted these and many more paintings of Shirdi Sai , his name is Shri Sunil Shegaonkar. 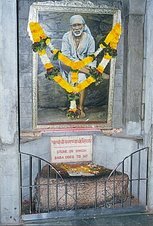 There was one devotee with me who had seen Sai Baba’s painting in Temple of Baba, in a near by town Ankleshwer. When he had first heard, that the devotees where buying a picture, which to him seemed expensive. All that changed when he saw the picture arrived decorated the walls of Temple. Baba greatly attracted him towards His painting, a friend who went along with him was drawn to the painting and did sastang Namaskar to the painting. His earlier thoughts about the devotees buying a picture at a expensive rate vanished. The painting was worth much more than what devotees had paid, he thought. Since then, he had desire to meet the artist through whom such great painting of Sai Baba was created. Well, he met him while in Shirdi, and since i was along with him, i met him too. Along the course of discussion on our sadguru Sai and his stories and the art work of the artist. i requested Shri Sunil Shegaonkar that the rich art that flows through him should reach more temples and devotees home. He agreed. So here we are, devotees who would like to decorate the temples they visit or are actively involved. Here is the chance to buy Sai Baba’s hand paintings from Sunil Shegaonkar, whose paintings also decorates temples and divine places in Shirdi. Replica paintings, of the paintings given in the post can be ordered or a totally new theme, may be from Shri SaiSatCharitra or other stories of Sai Baba can be discussed, for a new hand paintings on canvas. Once the order is placed, it will take about 45 days for the painting to be complete. Also, if there are pending deliveries the time taken can be more and it would be notified before the orders are placed. These paintings are not manufactured mechanically and the artist needs about 45 days per painting. Last to pictures on this post are relatively larger picture if you click on them, Om Sai Ram. For those devotees who would like to get photo print. You can have a look at few more artwork paintings and hand painted portraits of Sai Baba by Sunil Shegaonkar. EXCELLENT Pictures...Photo madle bhaav khup apratim ahait...!! Bab`n kade bhagitla ki khup prassanna wat te. These paintings offer a lively glimpse into shirdi days. A person loving sai will sure feel Him going through these Sai images. MAY SHRI SAI BLESS US ALL !These paintings offer a lively glimpse into shirdi days. A person loving sai will sure feel Him going through these Sai images. 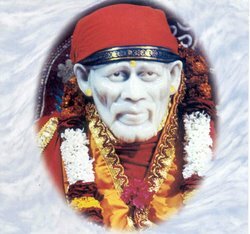 MAY SHRI SAI BLESS US ALL !